Friday’s ad is for Pabst Blue Ribbon, from 1953. Starting in the early 1950s, Pabst started a new ad campaign with the tagline “What’ll You Have” which lasted for a few years. They were colorful ads, and often had the tagline spelled out in creative ways. 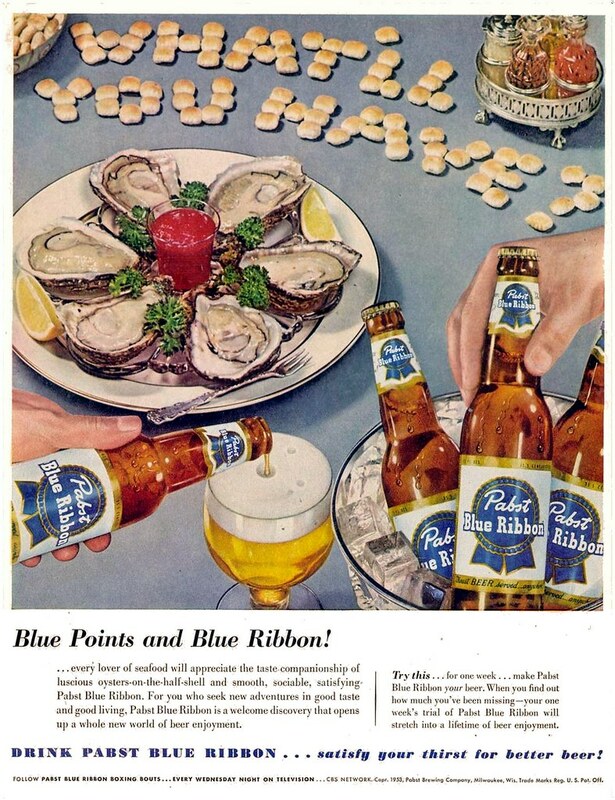 In this ad, “What’ll You Have” is written in oyster crackers next to a plate filled with blue point oysters. In the foreground, there’s an ice bucket of PBR bottles, which makes sense because I’d need a lot of beer to eat that many oysters. Today is the birthday of William Wilson Sloan (July 6, 1831-May 7, 1901). He was born in Ireland, and moved to Buffalo, New York. Originally a malster, he bought into Buffalo’s fifth brewery, the McCulloch Brewery around 1857. There’s very little I could find about Sloan, and even less in the way of images or photographs. Alexander McCulloch and his son John were listed as brewers, Seneca Street in the 1832 Buffalo Directory. Charles C. Relay of Buffalo’s second brewery is also listed as a brewer, Seneca Street. Could Relay and McCulloch have brewed together for a short time? The “Hydraulics” was an area near present day Seneca and Hydraulic Streets where a canal was dug in 1828 from Buffalo Creek to produce hydraulic power for an industrial zone. The 1832 Buffalo Directory lists this area as having a grist mill, hat body shop, pail factory, last factory, woolen factory and one brewery believed to be McCulloch’s. Around 1836 the Hydraulics name was changed to “Clintonville” with a population of 500. It was later incorporated into the city of Buffalo. Alexander had three sons with his wife Elizabeth: Alexander Jr. the eldest, John H. and James. Alexander Sr., who turned the brewery over to his eldest son around 1836, continued to live in Clintonville with his wife until his death around 1846. The McCulloch’s became an important family in what was then called the “Hydraulics” or “Clintonville”. Alexander Jr. and his brothers operated their brewery located on Mill Street near the Hydraulic canal (later Hydraulic St.) until 1843 when they relocated to Steuben Street (later becoming part of Carroll Street) also near the Hydraulic canal. The Attica Railroad laid tracks into Buffalo down Mill Street in the early 1840’s. This is probably what caused McCulloch to relocate his brewery to Steuben Street. In 1847 the McCulloch’s sold their brewery to James H. Barton and Matthew J. Gilman. The Barton and Gilman Brewery operated until 1857 when it was sold to William W. Sloan. Sloan named his brewery the Hydraulic Brewery. The location remained the same but the address changed to 686 – 702 Carroll Street. Sloan continued brewing and malting at the Hydraulic Brewery until 1876. And the web page History of Buffalo has a little more about the Hydraulic Brewery. 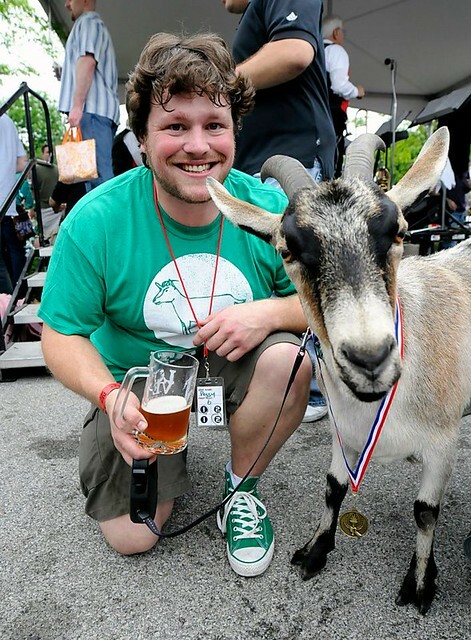 Today is the 34th birthday of Colin Presby, head brewer at Golden Avalanche Brewing in Kutztown, Pennsylvania. He grew up in nearby Reading, like me (although for me it was nearby Shillington) but I was very familiar with Kutztown (my first wife went to the University there and so did my great-grandfather). Colin and I haven’t met in person but were introduced online through a mutual friend — Maureen Ogle if memory serves — and have corresponded quite a few times since, and I suspect we’d be fast friends if I still lived in the area I affectionately refer to as Dutch Wonderland. Join me in wishing Colin a very happy birthday. 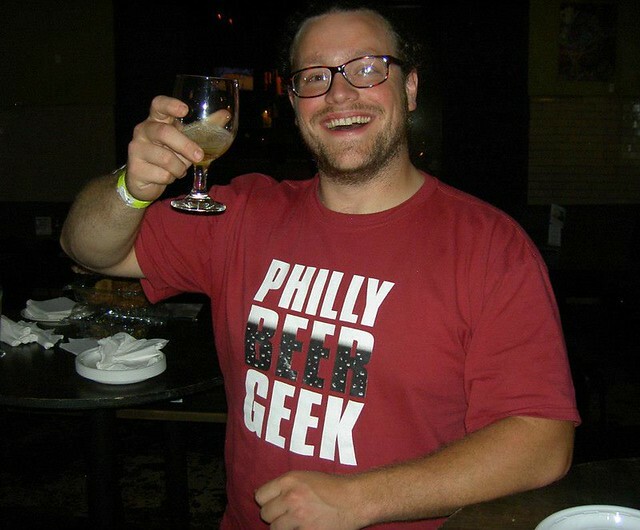 Colin at the Philly Beer Geek competition in Philly in 2013. Colin and Peggy at the 2012 Sly Fox Goat Races. 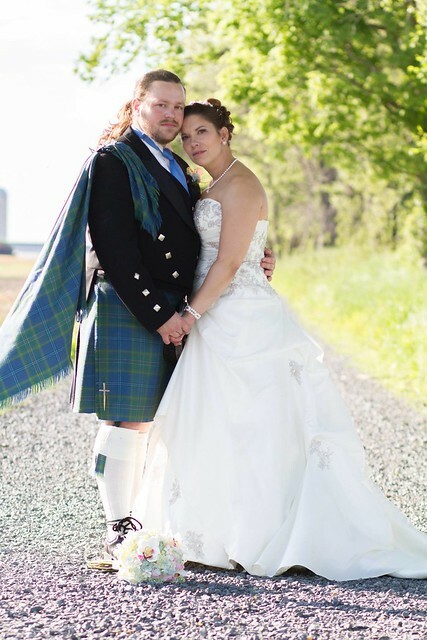 The wedding couple last year when Colin married Fatman Jake (presumably not the name her parents gave her). Colin (a.k.a. 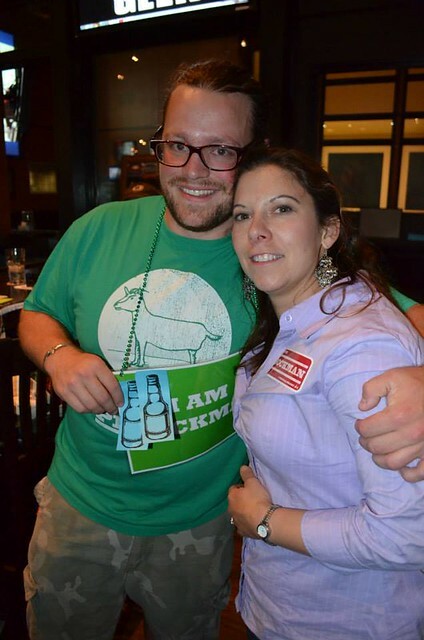 Bockman) and his wife at the Philly Beer Geek finals in 2013. 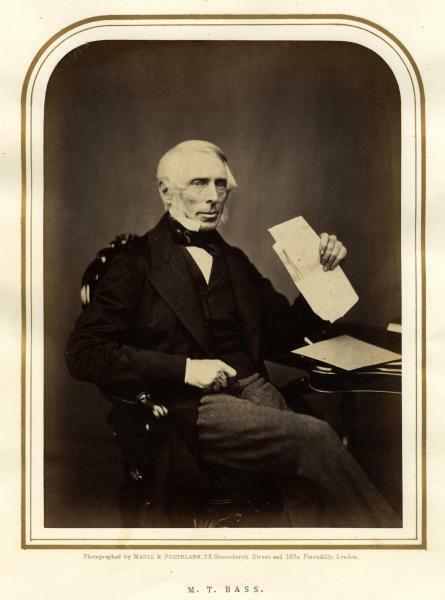 Historic Beer Birthday: Michael Thomas Bass Jr.
Bass was born in Burton upon Trent in 1799, the son of Michael Thomas Bass (senior) who had expanded the Bass brewery founded by his father William Bass in 1777 and made it a major exporter to Russia. His mother, Sarah Hoskins, was the daughter of Abraham Hoskins, a prominent lawyer of Burton. Bass attended the grammar school in Burton upon Trent and finished his schooling in Nottingham. At the age of 18, he joined the family business as an apprentice when business was not going well because the Napoleonic Wars had disrupted trade with Russia. However, the sales of India Pale Ale in India and southeast Asia were taking off by the 1820s. The coming of the railway to Burton upon Trent in 1839 helped the growth of the business by reducing transport costs. The company had four agents in the 1830s in London, Liverpool, Stoke-on-Trent and Birmingham. By the 1880s, this had grown to 21 in the United Kingdom and another in Paris. The export trade was supplied by the agencies in London and Liverpool. Under Bass’s leadership, company production and sales had grown enormously. Production of ale had grown to 340,000 barrels in 1860 and to almost a million barrels in the late 1870s. By 1881, the company had three breweries and 26 malthouses covering 145 acres (0.59 km2) in Burton upon Trent. The company was Britain’s biggest brewery and was one of its best known companies. Bass was first elected as the member for Derby in 1848 and served until 1883. His obituary in the Brewers Journal stated that he was known more “in the House of Commons for his regular attendance than for any feats of oratory.” He focussed on being a national advocate for the brewing industry against efforts by nonconformists within the Liberal Party to legislate against alcohol. Bass was an orthodox Liberal supporting free trade, low taxes and improving living standards for the working class. He promoted legislation to abolish imprisonment for small debtors. His legislation against organ grinders on the grounds that they were street nuisances was less successful. He was known as a philanthropist both in Burton upon Trent and Derby. His obituarists claimed that his contributions totalled £80,000 and that he had given Derby a new library, School of Art, recreation ground, and swimming baths. Bass represented Derby until the final years of his life. William Ewart Gladstone offered Bass a peerage which he declined preferring to stay in the House of Commons. And here’s another biography, this one from the Dictionary of National Biography, 1885-1900. 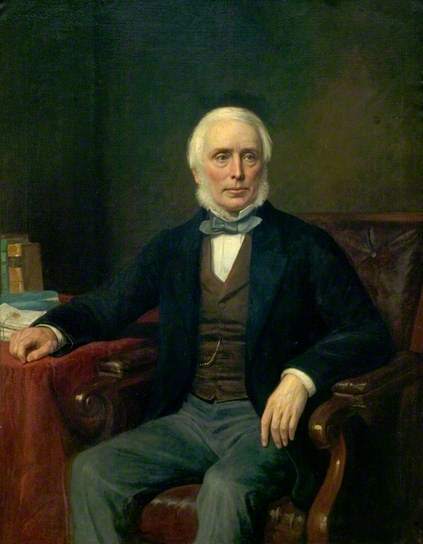 BASS, MICHAEL THOMAS (1799–1884), brewer, was born on 6 July 1799. He was the son of M. T. Bass and grandson of William Bass, both of whom carried on extensive brewing establishments at Burton-on-Trent. Bass was educated first at the grammar school, Burton-on-Trent, and afterwards at Nottingham. On leaving school he joined his father in business and acted as a traveller. The opening up of the Trent and Mersey Canal gave the first great impetus to the trade of the Burton breweries, and the firm of Messrs. Bass did not fail to utilise this and other developments of modern enterprise. Bass’s first official connection with the county of Derby was as an officer in the old Derbyshire yeomanry cavalry, in which capacity he assisted in quelling the local riots which occurred before the passing of the Reform Bill of 1832. 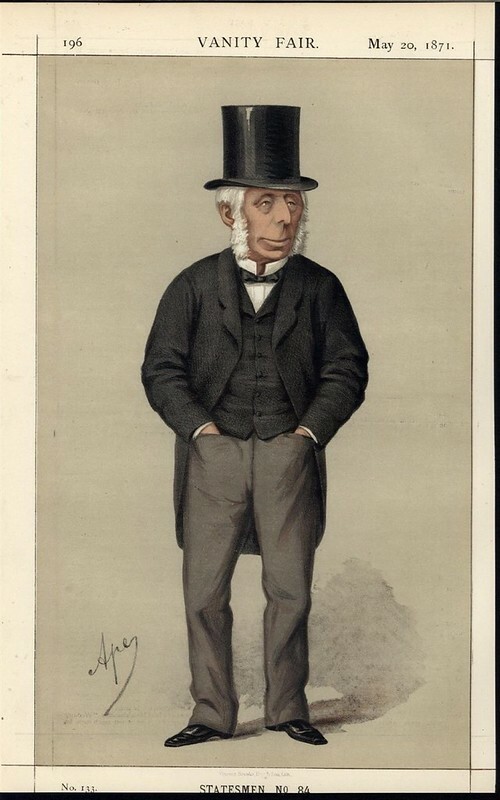 He speedily acquired an important position in the county, partly from the extensive ramifications of his business, and partly from the interest he took in public affairs, and in 1848 he was requested to come forward as a candidate for Derby in the liberal interest. The sitting members had been unseated for bribery, and in the election which followed Bass was returned at the head of the poll. For the borough of Derby he continued to sit uninterruptedly until his retirement in 1883. Bass was a liberal. He was assiduous in the attention he gave to his parliamentary duties, but was not a frequent speaker. His personal character gained him the esteem of opponents and friends. 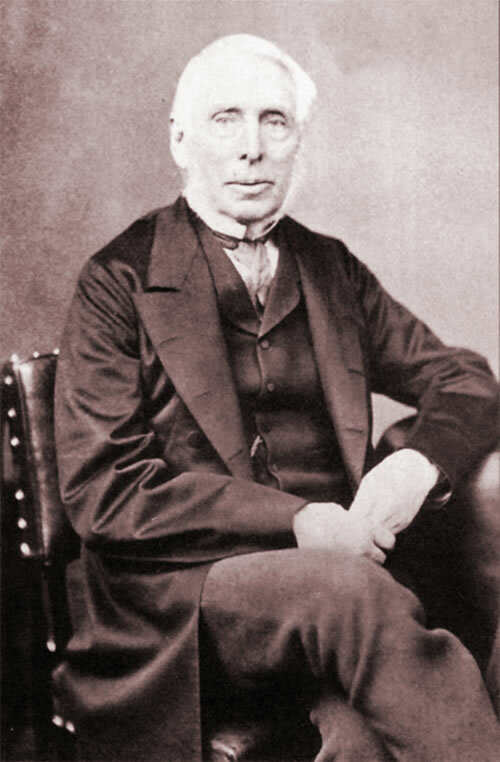 He exhibited a lively concern in all questions bearing upon the welfare of the working classes, and in 1866 he requested Professor Leone Levi to institute a wide and methodical inquiry into the earnings of the working classes throughout the kingdom. Bass brought in a bill by which householders might require street musicians to quit the neighbourhood of their houses. A letter of thanks was j addressed to him by a number of the most distinguished authors and artists in London, including Carlyle, Tennyson, Charles Dickens, J. E. Millais, Francis Grant (president of the Royal Academy), and others. Bass also took an active part in abolishing imprisonment for debt, but his popularity at Derby suffered a temporary check by reason of his opposition to the Ground Game Act. The constituency, however, never swerved from its allegiance, although between the time when he was first elected and the last occasion when he was returned to parliament the number of electors had increased tenfold. When the agitation arose amongst railway servants in 1870 for a reduction in their oppressive hours of labour, Bass was their most powerful friend. By his instrumentality an agent was despatched throughout the country to gather information and organise plans for relieving the condition of railway servants and removing the grounds of their complaints. The facts made known led to the establishment of the Railway Servants’ Orphanage at Derby. The new church of St. Paul’s, at Burton, was built and endowed by Bass. He also raised a smaller church near his residence, Rangemore, a chapel-of-ease, Sunday schools, and an institute and reading-rooms for the use of the working classes of Burton. The entire cost of his benefactions to St. Paul’s parish in that town has been placed at not less than 100,000l. In addition to this, and to private charities almost innumerable, he presented the town of Derby with a large recreation ground and public swimming baths, at a cost of 12,000l., as well as a free library involving an outlay of 25,000l., and an art gallery upon which many thousands of pounds were expended. Bass died at Rangemore Hall on 29 April 1884. He was extremely simple in his tastes and habits. He refused all offers of social distinction, declining a baronetcy and a peerage which were offered him by successive governments. As a mark of the general esteem, however, in which he was held, a baronetcy was conferred (during his own lifetime) upon his eldest son, Sir Michael Arthur Bass, M.P. for East Staffordshire.